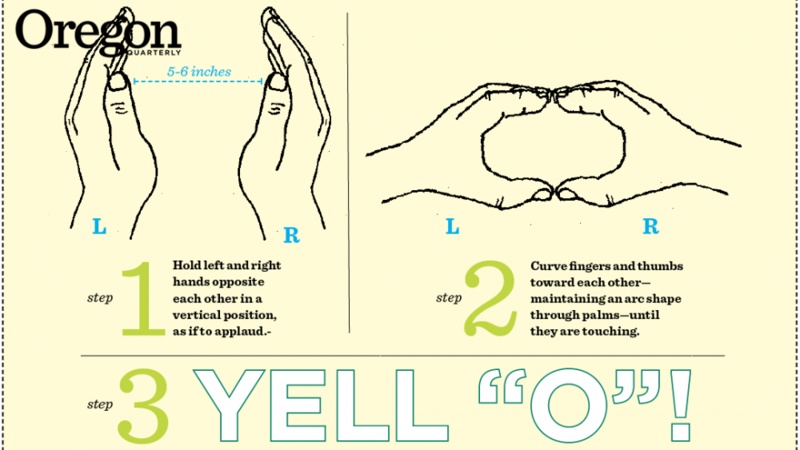 Welcome to “Making an ‘O’ with Your Own Two Hands 101.” Some of you will be photographed, some will be on video at a national sports venue, so let’s get this right! Touch your fingertips plus your thumb tips together. Now create a circle; yes, an O is a circle. Well, some of you need to work on that. You’re making a triangle and some of you a pyramid. You will be tested soon! If you can’t accomplish the task, please keep your hands to yourself! The Winter 2015 Oregon Quarterly made mention of Professor Luther Cressman. I recall a photo of Cressman in the Quarterly some years ago. He and another professor are standing in front of a 1920s automobile, both dressed for field work in eastern Oregon, looking like Indiana Jones and Hiram Bingham, and packing serious large pistols. Please find some excuse to print that photo again. I was impressed with the article regarding Aisha Almana, BS ’70 (“Driving Change,” Winter 2015), instigating the protest allowing women to drive and working on the women’s right to vote—I love her audacity, bravery, and courage in Saudi Arabia, which denies some of the best minds to bloom (many thanks to her father). I want her to know that America was just as backwards in the early 1900s; our right to vote changed in August 1920 when the 19th Amendment was finally ratified. Her perseverance will change the world and maybe, just maybe, raise the consciousness of some of the men in that part of the world.